This course provides participants with the fundamental knowledge and hands-on experience to design a spacecraft or satellite attitude control system. 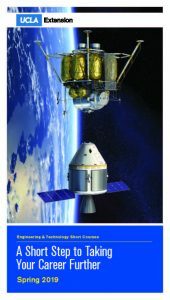 The focus is on modern practical design and analysis methods illustrated by real spacecraft design from industry. Although designed for practitioners, the fundamental theory behind the design methods also is highlighted and derived. More importantly, numerous modern real-life spacecraft attitude control design examples, such as Spaceway, ACROSS II and Cassini, are illustrated in detail using the latest tools developed in MATLAB/SIMULINK. Using the design methodologies and tools presented in this course, participants should be able to begin modeling spacecraft dynamics in detail, design basic spacecraft attitude control systems, attitude determination algorithm, and perform trade-off study on approaches, hardware, and performance requirements. UCLA Extension has presented this highly successful short course since 2008. Over years, hundreds of aerospace engineers have taken this course throughout the country. The text, Spacecraft Dynamics and Control: A Practical Engineering Approach, Marcel J. Sidi (Cambridge Aerospace Series, 1997); examples and demos; and published papers are distributed on the first day of the course. The notes are for participants only and are not for sale. Richard Y. Chiang, PhD, Sr. Engineering Specialist at Control Analysis Department, The Aerospace Corporation. Dr. Chiang is a nationally and internationally recognized expert in robust control system design and system identification. He is the leading author on the MATLAB software, Robust Control Toolbox, of which nearly 25,000 copies have been sold worldwide across industries and academia for the last 29+ years. His modern robust control design methodology has become a universal standard in the field. Dr. Chiang began his career in 1979 as a control system analyst at Garrett AiResearch. During the 1990s, he also worked for Northrop Aircraft on F-18 supermaneuver flight control and at JPL on large space structure vibration control. Since joining Boeing in the late ’90s, he has designed attitude control systems for 15+ satellites and analyzed system stability for 20+ programs. Since 2016, Dr. Chiang has joined The Aerospace Corp. and monitored several key national space programs. He has taught senior control courses at USC since 1995; given control seminars at DEC, Northrop, General Dynamics, and JPL in the 1990s and several at Boeing from 2002 to 2015. He is an instructor of two other UCLA Extension courses on robust control and MATLAB analysis. Dr. Chiang also has published 17 journal papers and 28 conference papers, and has 8 issued U.S. patents and 4 patent applications pending related to spacecraft control system design. He is an Associate Fellow of AIAA and a Senior Member of IEEE. Davin Swanson, PhD, Systems Director, The Aerospace Corporation. After joining The Aerospace Corporation in 2003, Dr. Swanson spent over a decade supporting multiple space programs in the areas of spacecraft and payload attitude determination and control. His specific areas of expertise are gimbaled payload control, line-of-sight determination, control-structures interaction, control systems engineering, and high frequency jitter evaluation. He has been a member of the NASA Engineering and Safety Center Guidance, Navigation, and Control Technical Discipline Team and has chaired multiple unclassified and classified sessions at the American Astronautical Society Guidance and Control Conference. What is a spacecraft attitude control system (ACS) and its functions? —Attitude determination algorithms: TRIAD, Kalman filter, etc.